Home > Buckhannon > Robert M. Morris; a Lawyer for Others to Emulate. Robert M. Morris; a Lawyer for Others to Emulate. A friend of ours died Nov. 13, 2017. Here are “just the facts”. And below are a few of my thoughts from the perspective of a nearly 40 year friendship. In the late ’70’s, I was appointed by the Lewis County Circuit Court to represent Anthony “Tony” Audia in an alleged armed robbery at Cowger’s General Store in Crawford WV. Bob was appointed to represent co-indictee Thurman Dye, aka “Diddie”, of Mt. Claire. Thurman and Tony allegedly had a drug gang. The case itself has lots of interesting twists and turns, but even 40 years later, confidentiality prevails. I may have met Bob at the preliminary hearing, where we learned that Mr. Cowger claimed he resisted an effort, through threat of force, to rob him, and as a result the small, but feisty, old man was wrapped in rope, covered with a burlap sack, and struck on the head with a Coke bottle that broke. We decided to drive together to Crawford to view the scene and interview Mr. Cowger. We chatted, and chatted. I learned of Bob’s service in Vietnam, his devotion to his wife, that they had no children, but he had powerful devotion to looking out for children, as a result of which he was a leader in Big Brothers Big Sisters and a loving uncle. We chatted all the way to Crawford. I drove past the turn-off from Route 19, and had to turn around and come back. Mr. Cowger readily spoke with us. I admired the old gent, who was none the worse for wear and had resisted two younger and stronger men in spite of the obvious danger. The kind citizens of Crawford gathered around us, but Bob and I were permitted to “escape” without incident. Whereupon, I turned the way we came in and drove us “north” for an hour, not! Actually, we drove together south to Spencer, chatting every minute and not realizing that by turning left, I took us south, the direction from which we arrived when I missed the turn on the way in! That began a life of friendship in the context of our legal careers. Bob and Joyce never moved from Fairmont, where Joyce was a highly regarded, and awarded, Reading teacher, and we have lived in Buckhannon for 41 years. In 1979, I received a call from Weston lawyer John S. Holy, who was in need of triple bypass heart surgery and someone to mind his practice while he was away. I decided that my time with Rexroad and Rexroad had run its course, having arrived the week of July 4, 1976 from Griffiss AFB Legal Office, Rome NY, after four years in the JAG Corp.
After a year, John returned, fit and ready for another 18 years or so in the practice of law, which he did into his 90’s. His office was running smoothly, and my confidence, was increasing. By then, Bob Morris was my best friend in the practice of law. I courted Bob for many weeks and sold to Mr. Holy the idea of Holy, Hunter, and Morris. Bob approached the decision of whether to leave Russ Stobbs with the same methodical care he approached everything. It almost drove me nuts, but finally he assented, and we spent some very pleasant time together, with congenial meals, collaboration in cases, and a joint devotion to our aging partner who we felt was our legal grandpa. Bob developed the knack of mimicking John’s commentaries of the world, to great effect. Bob and Joyce “adopted” the Holy’s including arranging and managing each of their funerals. Joyce was Bob’s perfect life partner; gentle, funny, and devoted. Our prayers are with her now. Finally we parted, as Bob and John considered spending $7000 on an Apple II personal computer and NEC printer to be a foolish endeavor, and I considered their 7 year old IBM Mag Card, to be a dinosaur, which needed to be put out of its misery. Wrong! It lasted much longer than our partnership! But, we still attended seminars in Charleston together, collaborated, lunched, and chatted. I loved getting the calls, hearing the sonorous voice, “Mr. Hunter, Robert Morris here.” Never; “Hi Burt, this is Bob!” When the other called, we each tried very hard to be of service. It was as if our firm still existed. He would call me about personal injury, family, and civil matters, and, after he became assistant prosecuting attorney, I would call him on juvenile, criminal, and real estate matters. Bob was honest, caring, smart, meticulous, dutiful, serious about his craft, witty (especially at serious moments such as funerals), diligent every day of his life, well-liked by colleagues, friends, and family, but very private. He was “old fashioned” in the very best way. The kind of person people relied on. His judge Thomas Keadle confided Bob was his “go to” guardian ad litem, when someone under a “legal disability”, infant, incarcerated convicted, on incompetent, needed a guardian in the law. He refrained from self promotion. Just try to find him as Robert M. Morris, or Robert Marvin Morris on Google. Yet, when we tackled a case together, it was a most effective team. We shared our ideas, laughed, compromised, and moved forward. We shared some nice fees, and licked our wounds quietly. 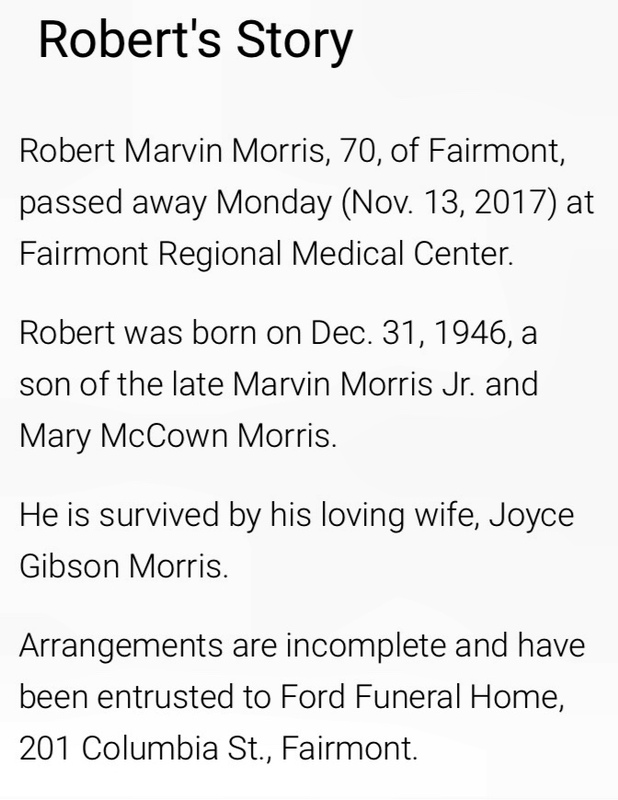 I feared for the worst when I heard his diagnosis, was still startled when he retired on two days’ notice, and my heart sank when Bob was not able to attend the funeral of our law partner’s wife, Mary Jo Holy, in early October of this year. Bob and I spent 20 years or so organizing the Lewis and Upshur Bar meetings, especially joint meetings. If he said he would do something, he did it. Like the GEICO commercial. It’s what he did. We were “put out to pasture” 20 years ago by the younger lawyers, so thus ended all but a tiny few bar gatherings. Many senior lawyers in Lewis and Upshur moved on without any ceremony from their peers. I write this partly because there will be no such event for Bob. Yet, I dare you to try to find a Lewis or Upshur County lawyer who thinks he doesn’t deserve it. We were “old-fashioned”, raised by members of the WW II generation, and bound in tradition. John in fact was a 40 year old WW II air craft mechanic who attended Law School thanks to the G.I Bill. Bob didn’t change. I have tried to embrace change. But that didn’t detract from the fact that we loved the practice of law, loved our clients, friends, and families, and loved one another as brothers in the law. ** Footnote: Not to ruin it for you, but after we lost our respective trials, we each appealed. to the WV Supreme Court of Appeal and lost. But Tony’s case was written up in Lawyers’ Co-op’s Annotated Law Reports (ALR) as a classic in how NOT to conduct a lineup. That evidence was excluded, but the Court ruled that there was plenty of other evidence to convict. Sorry Tony and Thurman.